Ultra large and spacious, the Jackson Mammoth Sectional in Smoke is called ‘mammoth’ for a reason! 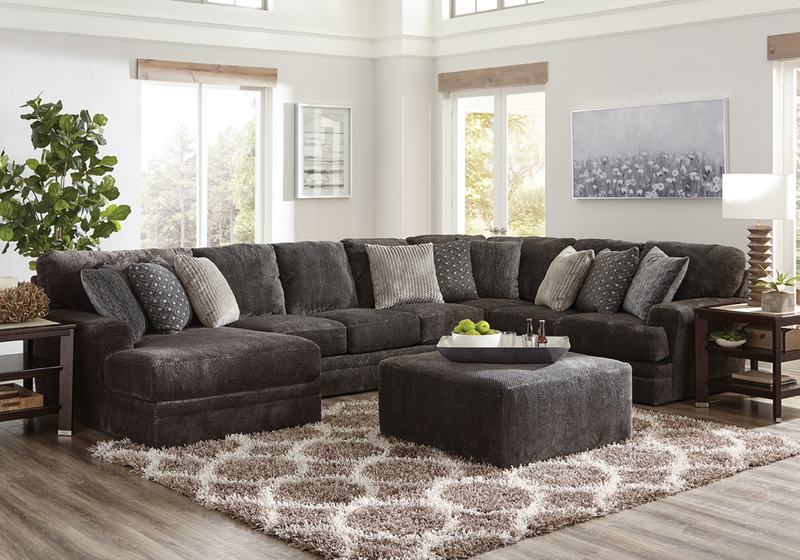 All over every visible inch of the sectional is ultra-plush, textured polyester fabric that feels nice to the touch. The included pillows make it even more comfortable and inviting. The seat cushions feature comfort coil and Comfor-Gel seating that delivers a smooth, comfortable and supportive ride. The entire sectional is upheld by a durable and reliable steel frame that will support the sectional for its entire life. This furnishing comes in a handsome, neutral smoke color. *LAF chaise sectional means the chaise is facing the left when looking at the sectional and on the right when you are sitting. *Sectional includes LAF chaise, armless loveseat, and RAF corner sofa. The Mammoth Sectional Collection by Catnapper features luxuriously soft chenille fabric, fashionable contrasting accent pillows, steel seat box construction and Comfort Coil Seating featuring Comfor-Gel. Frames, comfort coil cushions, and springs are made from the finest materials. Its state-of-the-art frame and mechanism construction can hold up to whatever your family dishes out. The fabrics are wear-tested in the test’s lab before being Catnapper certified. Genuine Catnapper furniture stands the test of time and is crafted to the highest quality standards. Moreover, before its products are sent out the door, they’re real-life tested, because superior quality control is number one priority. For more information about Jackson Furniture’s warranties, click HERE. All finishes and other parts, components, and other furniture products, including but not limited to dining room tables, chairs, occasional tables, beds, dressers, marble tops, granite tops, desks, curio cabinets, china cabinets, buffets, entertainment centers, lamps, electrical components, and handles incorporated into any furniture product, are warranted by the manufacturer to you, the original retail purchaser, for one year from the date of purchase, to be free from material manufacturing defects. The manufacturer will pay, within one year from the date of purchase, reasonable and customary labor rates to repair or replace the defective parts and shipping costs from the retailer to and from factory, or a repair center designated by the manufacturer’s customer service dept. at no charge to the original retail purchaser. Jackson Furniture opened its doors in 1933 during the midst of the Great Depression, and since then their family has continued to create quality, American-made furniture in Tennessee. Throughout the decades of change in our country, one thing remains constant: Families love to relax together in a room filled with comfortable furniture. Jackson™ (stationary living room) and Catnapper™ (reclining living room) furniture is made for the young, the old, the small, the large, the classic, the contemporary, and so on. They believe that Every Body should have a comfortable seating experience. Leaning on their heritage of over 80 years, they have ALWAYS focused on the best manufacturing techniques and designs to provide every consumer a product they can afford and be proud of.